One of the biggest games released for Xbox One so far is Halo 5: Guardians. Halo has been the flagship franchise for Xbox since 2001 when Combat Evolved convinced millions of gamers to buy the original Xbox. Microsoft hopes that the first Xbox One Halo game can give their next-gen console a lift as well. The new chapter of Halo brings some big changes to the series. However, Microsoft has also included plenty of familiar elements as well so long-time fans will feel at home. Here's everything you need to know about Master Chief's return. Initial clues about Halo 5's story came from the cinematic trailer from E3 2013. The trailer began with a cloaked figure walking through a desert. An enormous robot rises from the sand and flies into the sky. The cloaked person pulls out a crystal chip on a dog tag and inspects it. The robot opens up its wings, sending out a blast of wind. 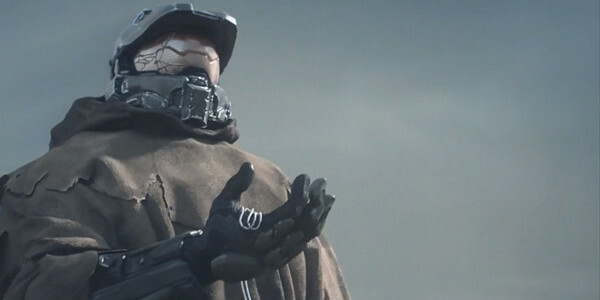 The wind knocks off the cloaked figure's hood, revealing that it's Master Chief (aka John-117). Later trailers for Halo 5 revealed that the story has more shades of grey than past games. We learn that Agent Locke and a squad of Spartans are actually hunting him down. That's a big shock, considering he's a hero to all of mankind. What could Master Chief have done to provoke this manhunt? In one commercial for the game, we see a UNSC representative announce that Master Chief has been killed in action. Is that just propaganda or will we see Chief go through yet another near-death experience? We'll find out in Halo 5. 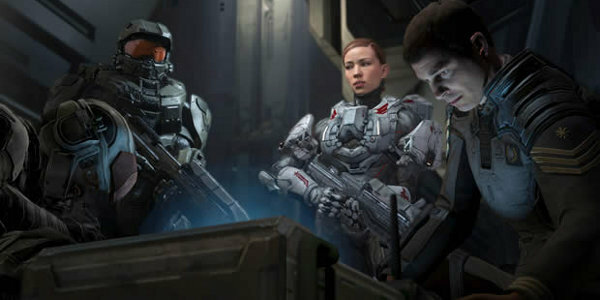 Players take on the role of Master Chief and three Spartan allies in the four player co-op campaign. The official box art for Halo 5: Guardians shows an armored figure standing in the desert. A mirror image below him shows Master Chief in the exact same location. 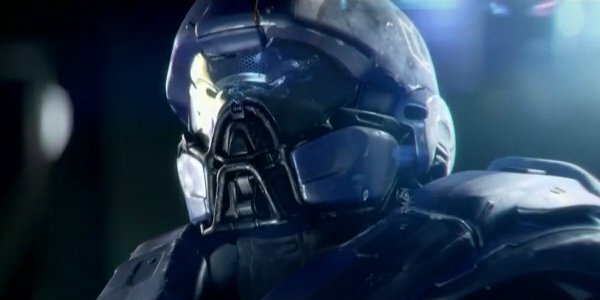 Some speculated it could be Spartan Palmer or perhaps even Cortana. Executive producer Josh Holmes said on Twitter that it's a brand-new character, though. We were then introduced to this character, Agent Jameson Locke, in a live-action series called Halo: Nightfall. In Nightfall, Locke is part of an ONI unit sent to stop a Covenant group from detonating a biological weapon. In the course of the mission his team destroys a part of Installation 04, one of the Halo installations throughout the galaxy. After the events of Nightfall, Locke receives SPARTAN-IV augmentations. He's then placed in charge of Fireteam Osiris, a squad sent to find Master Chief. Players will control Locke and his Osiris squadmates on this mission for part of Halo 5's campaign. The data chip Master Chief was clutching in the Halo 5 trailer is probably the storage device that once held Cortana. Cortana, his A.I. companion for the previous Halo games, began to deconstruct in Halo 4 because she was past her seven-year lifespan. She manages to save his life and say goodbye before shutting down for good. Master Chief is probably keeping her data chip solely as a memento of his long-time friend. Her "death" was one of the most pivotal moments in Halo 4 and the series so it seems unlikely that the development team would reverse it by allowing Chief to resurrect her somehow in Halo 5. Maybe her data chip will prove useful to him in some way in his journey, though. The giant robot in the trailer isn't something we've seen before in another Halo game. However, its crystalline shape and orange/yellow lights suggest that it's a Promethean construct. Prometheans, warrior-servants of the ancient Forerunner race, were the main enemies in Halo 4. Though the Prometheans were decimated during Halo 4, it's almost certain we'll see them again. They were the first new group of enemies introduced in the game since Combat Evolved so why discard them so quickly? Even if the Covenant and Flood appear in Halo 5, the Prometheans are different enough from those foes that they won't feel redundant from a gameplay standpoint. Plus, the trailer suggests there are still some Promethean weapons and vehicles we haven't seen yet. 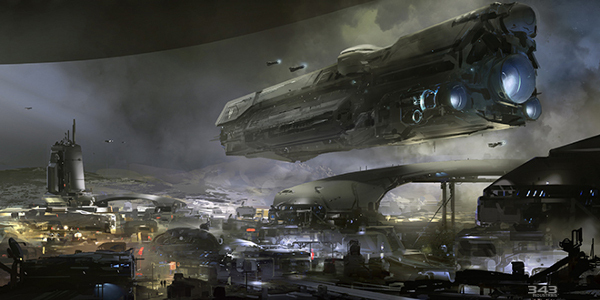 A piece of Halo 5 concept art from January seemed to show the UNSC Infinity hovering above an unknown planet. The Infinity is an experimental warship built from Forerunner and Covenant technology. The world they're visiting doesn't look like the desert Master Chief is trudging through but it could still be the same planet. The ship's presence in Halo 5 would be no surprise. The crew of the Infinity helped Master Chief on his mission during Halo 4. They were also the subject of a DLC campaign for the game called Spartan Ops. Sarah Palmer, one of the Spartans serving on the ship, was a main character of twin-stick shooter Halo: Spartan Assault. Acting captain Thomas Lasky's time in the academy and his first meeting with Master Chief were chronicled in a live-action series. The Infinity also appeared in two novels and two comic books. The Infinity and its crew are clearly important to 343 Industries' future plans for Halo. The departure of Cortana makes them even more vital as supporting characters. 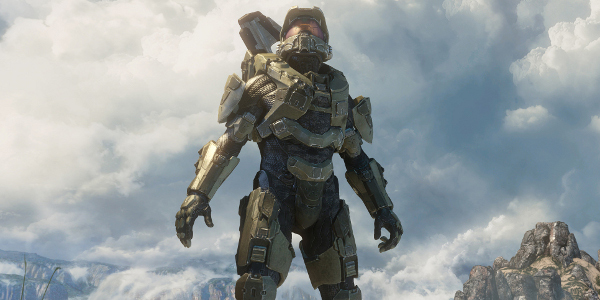 Wherever Master Chief ends up in Halo 5, you can be sure that the Infinity's going to be there to help him out. Maybe they'll even get their own campaign in this game. 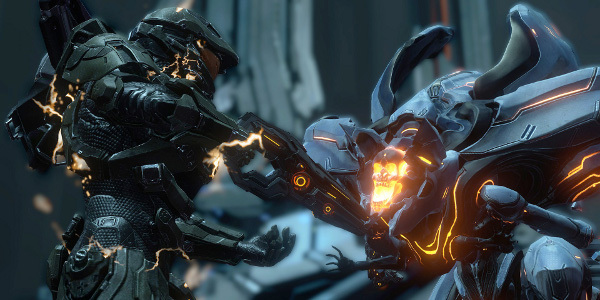 It makes sense that Halo 5 brings back friends and foes from Halo 4. Before H4's release, Microsoft said that it was the first chapter in a new "Reclaimer Trilogy". 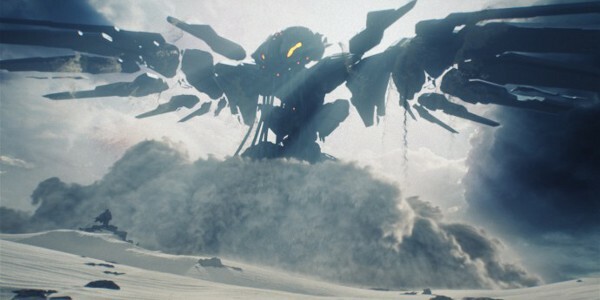 Phil Spencer later clarified that the "Reclaimer" story is actually a "saga" rather than a trilogy, so it could be far more than three games. 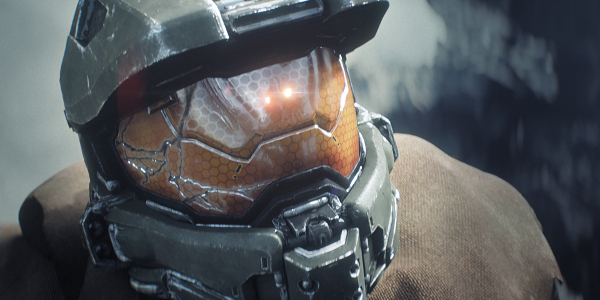 As the second game in a longer saga, Halo 5 won't have a self-contained story. It's going to create more loose ends than it wraps up. Master Chief's going to be a constant companion for the Xbox One in the years ahead. 343 Industries general manager Bonnie Ross said at E3 that Halo 5 will "take full advantage of the power and flexibility" of the Xbox One. The Halo Engine will be enhanced by the XB1's cloud-computing servers. Ross added that the game will run at 60 frames-per-second, making it the first console installment in the main series to do so. Ross re-confirmed the game's framerate in May 2014. She also said that the game features a brand-new engine. Like Nintendo and Sony, Microsoft uses their first-party games as a showcase for their hardware. They want Halo 5 to demonstrate the capabilities of the Xbox One. A smooth-running, beautiful Halo can go a long way in proving to developers and gamers that Microsoft's new console can go toe-to-toe with the PS4. 343 Industries confirmed in May 2014 that the game's full title is Halo 5: Guardians. This wasn't a huge surprise. 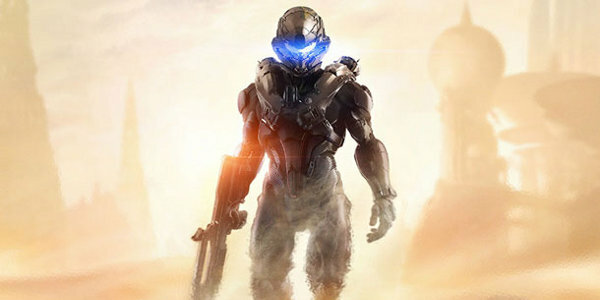 The first trailer clearly points toward a continuation of Halo 4 storyline. Furthermore, every Halo game starring Master Chief has had a number. The developers have only resorted to subtitles (Halo: ODST, Halo: Reach) when they're telling stories with other characters. They haven't revealed what the Guardians subtitle means, though. Is it a reference to the Forerunners or Prometheans? Or is it an entirely new faction? Halo 5 officially launched worldwide on October 27th, 2015. You can purchase it in four packages: the standard edition, $90 digital deluxe edition, $100 limited edition or $250 collector's edition. The CE comes with a statue of Locke and Master Chief and bonus story materials in addition to the in-game items from the cheaper packages. Microsoft also released a bundle with Halo 5 and the Xbox One. The console included with the package features a 1TB hard drive as well as a special paint job. It also plays Halo-themed sounds when you press the power or eject buttons. The Limited Edition extras for Halo 5 is also included. 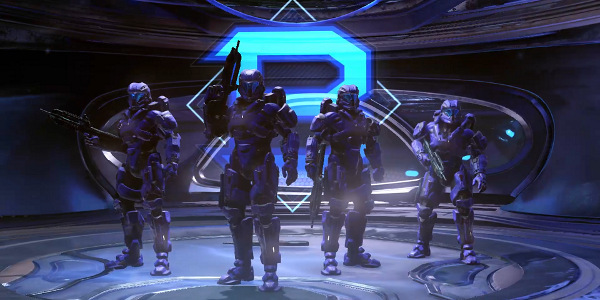 One of the main components of Halo 5's multiplayer is the Arena. The Arena modes are focused on small teams and include the traditional Team Slayer, Capture the Flag, Strongholds modes along with the new addition Breakout. Breakout pits teams against each other in a best-of-five series of rounds with no respawns. Arena also supports ranked matchmaking. Players will be pitted against opponents of comparable skill automatically. As they rack up wins, they'll climb through the ranks. The seven-tier ranked system is topped by the Champion rank, composed of the game's 200 best players. 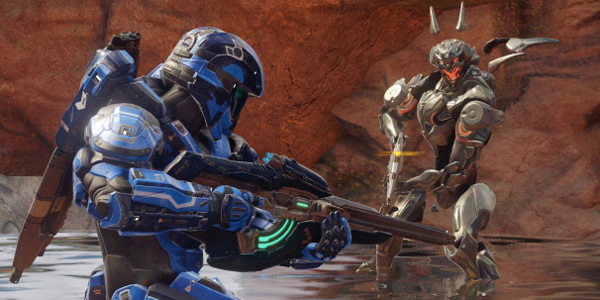 To accommodate Halo 5 players looking for larger battles, the developers included Warzone. In Warzone, two teams of 12 players will face off in expansive maps. The teams must capture strategic points and attempt to destroy the core at their enemy's base. Destroying the core isn't an easy task because the bases are defended by A.I. marines. 343 Industries estimates that these matches could take around 20-24 minutes. In an added twist, though, they'll also be attacked by a third force composed of A.I. foes. These enemies have to be cleared out of your team's base at the outset of the match. Boss characters will spawn periodically on the map as well. Defeating them will grant your team Victory Points. If one team fails to destroy the other's core, they can still win by having the most Victory Points when time runs out. 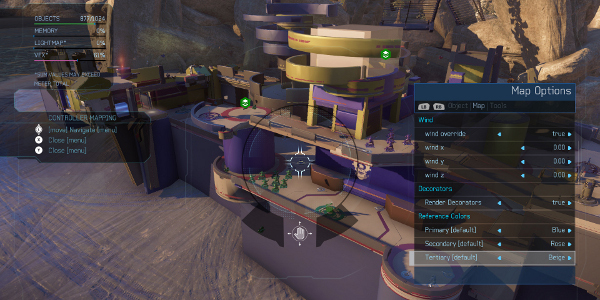 Like past Halo games, Halo 5 includes a Forge so that players can create and share custom maps. However, this latest version of Forge includes various improvements. 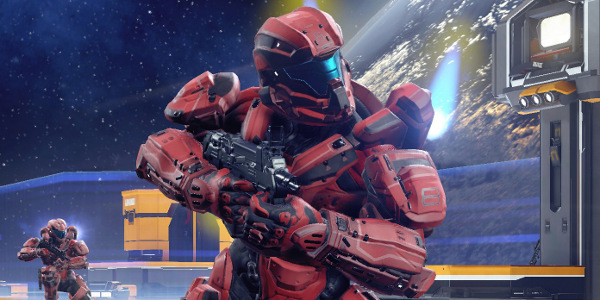 Halo 5 players will have over 1600 objects at their disposal for crafting these maps. New object types include invisible blocks, decals and FX emitters. Forge maps can now hold up to 1024 objects so players can make bigger, more detailed maps. They'll look especially pretty in this game, too, thanks to an overhaul of the lighting system. You can use Forge to edit any Arena map that shipped with Halo 5. 343 also included three canvas maps called Alpine, Glacier and Space that players mold to their liking. The Armor Abilities from past Halo games have been replaced with Spartan Abilities. These powers are available to all players and don't have cooldowns. Thruster Pack: Players get an extra lift to their jumps. It's speedier than the Thruster Pack from past games and keeps the player in first-person. Ground Pound: While in the air, players can slam down on the ground below and damage anyone you land on. Slide: Sprinting players can use their momentum to slide along the ground. Charge: While sprinting, a player can ram into an enemy. Sprint: Sprinting can be performed for an unlimited duration but stops the player's health and shield regeneration. Smart Scope: Players can zoom in with any weapon for added accuracy. The degree of zoom varies from weapon to weapon, though. As you can see, these abilities mainly enhance players' abilities to move through the map. On the bright side, this means the multiplayer will have a faster tempo. The downside, though, is that it's going to make enemies a lot harder to hit. 343 Industries plans to release 15 new multiplayer maps for Halo 5 by June 2016. They won't be charging players for these maps. "When you have paid map packs and content, you divide the player base into two groups: the haves and the have-nots," creative director Josh Holmes told Game Informer. "The people that have the map pack can play together but the people who don’t cannot. That to us is a real problem. So we’re delivering all the maps to all players free so everybody will be able to play together. That, we feel, is really important to having a great multiplayer ecosystem." While the developers will be dramatically expanding the multiplayer side of the game, the campaign won't receive any additions. Holmes said in an interview this week that there won't be any campaign DLC. Guess we'll have to wait until Halo 6 to see more of Master Chief and the rest of the Spartans.